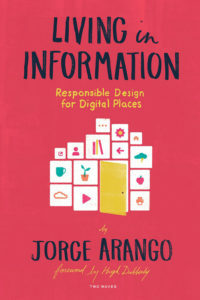 Living in Information: Responsible Design for Digital Places by Jorge Arango. Thus far in this book, we’ve been discussing tangible ways in which places influence our behavior. But there are also more subtle ways in which environments affect us. One that is of particular importance is how they impact our ability to focus our attention. Sometimes our attention is taken away by an exceptional occurrence, such as the sound of a breaking window. This is useful; the ability to respond quickly to changing conditions can help us escape danger. However, most of the time, we want to be in control of our attention. An environment that nudges us to spend more of our time there—or keeps interrupting us—would make it difficult for us to get things done. 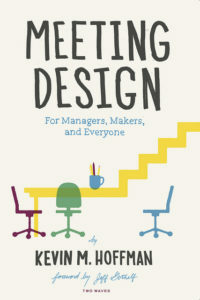 Editors’ note: This “Book in Brief” feature here on Boxes and Arrows is from Kevin Hoffman’s Meeting Design for Managers, Makers, and Everyone. When hundreds of hours of his design team’s sweat, blood, and tears seemed to go up in flames in a single meeting with a group of vice presidents, Jim could have easily panicked. So that’s what he did. Jim is a creative director at a successful and highly respected boutique design agency—let’s call it “Rocket Design.” He found a fantastic opportunity for Rocket through a former coworker’s new job at a Fortune 100 client—they were ready to spend half a million dollars to build the best website expe­rience possible in a competitive market: online meal delivery. After several weeks of discovery, his team had assembled a design direction that they believed could be effective. Baked into a collection of mocked-up mobile screens were strategies guiding content voice, brand execution, photographic style, and user interface functionality. To move into the next phase, Jim’s job was to make sure that the senior leadership at the company believed in the proposed direction just as strongly as his team did. Project managers on the client side navigated the rat’s nest of the leadership’s meeting availability to find a standing monthly hour in which Jim and his team could provide progress updates. Editors’ note: The second “Book in Brief” feature here on Boxes and Arrows is from Theresa Regli’s Digital and Marketing Asset Management: The Real Story About DAM Technology and Practice. 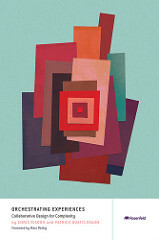 Use the discount code ‘dmambanda’ to add this to your library; it’s good for 20% off. Since the turn of the millennium, digital media—photos, audio files, video clips, animations, games, interactive ads, streaming movies, and experiential marketing—have become an increasingly significant part of our everyday experience. The combination of inexpensive, highly functional digital still and video cameras (even as part of mobile devices); increased network bandwidth; decreased storage costs; low-cost, high-performance processors; high-capacity, solid-state memory; affordable cloud services; and the requisite digital media infrastructure has laid the foundation for today’s vibrant electronic ecosystem. Whether you’re browsing the Web, listening to a song on an iPhone, watching a video on a tablet, opening a rich media email on your mobile device, or recording a TV series on a digital video recorder, you’re experiencing digital media. 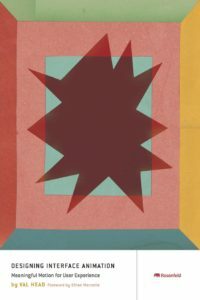 Editors’ note: We’re introducing a “Book in Brief” feature here on Boxes and Arrows. We’ll publish an excerpt, up to 500 words, of your book. The catch is that we’ll only publicize one book a month; first come, first serve. Other rules will certainly occur to us over time. Hit us up at idea at boxesandarrows.com. Val Head kicks off August with an excerpt from chapter four of Rosenfeld Media’s newest, Designing Interface Animation: Meaningful Motion for User Experience. Animation has the power to suggest space and movement in ways that none of your other design tools really can. This makes it especially useful for helping to communicate the lay of the land in your screen-based interfaces through visual hints and special suggestions. It also has the power to suggest depth and space, two things we encounter regularly in the physical world but are often difficult to replicate on-screen.